Last night, fans were finally privy to The Flash’s Barry Allen showing up on the CBS series Supergirl. During the episode, a competent Cat Grant was easily able to point out the fact that Barry Allen is actually the Flash, prompting many people to wonder if she has actually been equally as capable at deciphering Kara’s identity. So far, those close to the show are keeping a little bit mum, although executive producer Greg Berlanti revealed those fans may not be too far off. Here’s what he had to say in a recent interview. There’s a number of people that assume that she does know and just doesn’t say anything. Both are safe bets. We haven’t firmed up if and when we [will] clarify that point. I think it’s kind of enjoyable to appreciate the show both ways. Greg Berlanti certainly knows how to make a germane point while not giving away too much information. 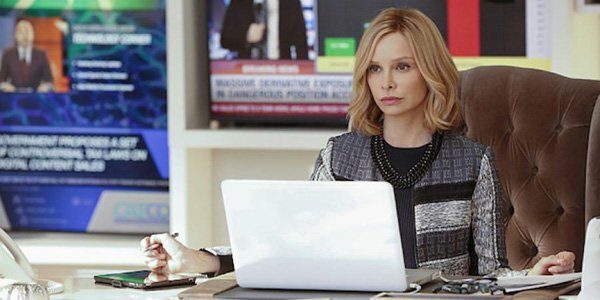 While speaking to TV Line, the executive producer noted there are fans on both sides of the argument, although it’s not actually possible for both opinions to be “safe bets.” Eventually, we are either going to learn that Cat Grant does know Kara Danvers is Supergirl or we are going to see her have that epiphany moment on the small screen. Obviously, the creative team is playing around with those concepts at this point and plans to keep us in the dark about the possibility for a while. This does Cat know or does Cat not know thing has already been played to death during the first season of Supergirl. Way back in Episode 8, Cat Grant actually seemed to know that Kara was Supergirl. However, during the next episode, the super-powered lady actually put together a ruse to make it seem like she was in two places at one time. What actually happened was that J’onn shapeshifted so that Kara and Supergirl could be in the same room simultaneously. Since then, Cat has been more open to the idea that Kara is still just a goofy executive assistant. Kara and Supergirl obviously look pretty damn similar, even though Kara wears the (unnecessary) glasses. Still, just a few weeks ago, DC’s Superman Henry Cavill went walking around the streets of New York while wearing a Superman shirt and no one batted an eyelash at him, much less asked for a photo. So, superheroes are still able to hide in plain sight. I’d like to think that Cat Grant is a smart cookie who is biding her time with the Supergirl secret. That’s better than thinking she’s so into her media empire and herself that she can’t see what’s (or more so who's) two feet in front of her during work hours. But if that’s the direction Supergirl is going in, it looks like we aren’t going to know right away. CBS’ Supergirl is actually finishing out its Season 1 run in just a few short weeks. The network only ordered 18 episodes for its freshman run, and the last one will air on Monday, April 18 at 8 p.m. ET. Although CBS has renewed a lot of series this spring, the network has yet to make a determination on Supergirl, yet. We’ll let you know as soon as we know. In the meantime, check out what is coming out this summer with our premiere schedule.